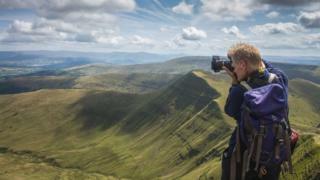 A photographer from Powys has spoken of his delight at seeing his shots of the Brecon Beacons form a backdrop to the Nato summit in Newport. Nigel Forster, from Talybont-on-Usk, photographed Pen y Fan and the central Beacons area for the main hall. The second room featured his images of the Black Mountains. "It was an enormous privilege to have contributed to the creation of such a prominent feature of such a prestigious event," he said. Mr Forster said he was contacted in July and was asked to take photos giving "a positive and striking impression of Wales and its landscape" as backdrops for the main conference rooms. He said he had been pleased "to showcase the Brecon Beacons to a worldwide audience and hope that it will play an important role in developing its profile to visitors from abroad". Mr Forster added that Prime Minister David Cameron congratulated him personally at a special event for Welsh suppliers involved in the summit.